Read our newsletters online or download them to your devices. Just before we began a week of teaching English to 21 of our Progresa scholarship recipients, a group of us had an introduction to life and culture in an indigenous Mayan town, under the care of veteran ESL participants, Jane and Joe Snyder. We began with the typical Guatemalan breakfast in a local restaurant, replete with fresh hot tortillas and fresh subtropical fruit. From there we proceeded along the edge of the public market to the Antigua bus terminal, where we found a boarded the brightly painted camioneta (sometimes known as “chicken bus”) for San Antonio Aguas Calientes. Settling into our 4th grader sized bus seats, we watched the countryside unfold as the bus pulled down the highway and turned off on secondary roads, where people boarded and descended going about their daily business. We descended the steep hill into Aguas Calientes, known for probably the most technically advanced and highest quality traditional weaving in Guatemala. We stopped, as directed, at the third tumulo (serious speed bump) to find Mañanas y Tardes Mayas, a small establishment run by 5 traditionally minded women dedicated to preserving and encouraging traditional weaving as well as other cultural practices, including use of the K’aqchiqel language. This important work is sustained by groups like us who pay a small fee for a gracious and informative introduction into their world. Jane, with her technical knowledge of fabrics and weaving, provided excellent translation for us, and helped deepen the bonds with our hosts, who sensed a kindred spirit. We learned a lot about weaving, including a chance to kneel at the loom ourselves for a few passes, the kinds of garments produced, and how they are culturally significant, the last by participating in a simulated K’akchiqel Maya wedding, replete with incense, music and dancing. We also had the chance to examine and purchase some of the spectacularly colorful and beautiful textiles and garments they produce. Finally, we were treated to a simple meal of pepián de pollo, a lovely subtly seasoned soup/stew that is a tradition in this part of Mayan Guatemala, along with fresh coffee and tortillas, which we got to try our hand at creating; not as easy as it looks. The deep and sincere gratitude that Lilián and Gloria, our primary hosts, expressed to us for our support of their projects as we departed was touching and heartwarming and disarmed any anxiety we had about being tourists. We hope to see them again next year. We walked down to the bottom of the hill to catch the bus back to Antigua. While waiting we discovered that the ATM was out of money, having been drained over the New Year and not yet refilled. Another typical Guatemalan experience. On the way back, we did, indeed, share the bus with a chicken or two. After the week of teaching, 11 of the teachers, one of our board members and a friend went on a tour of the Western Highlands led by our director, Miguel Costop. The tour commenced with a visit to the Mayan ruins of Iximché, near Tecpán Guatemala. Ichimché was the capital of the Kaqchiquel kingdom at the time of the Spanish conquest. While there, tour members witnessed Mayan religious ceremonies taking place at altars at the back of the site. 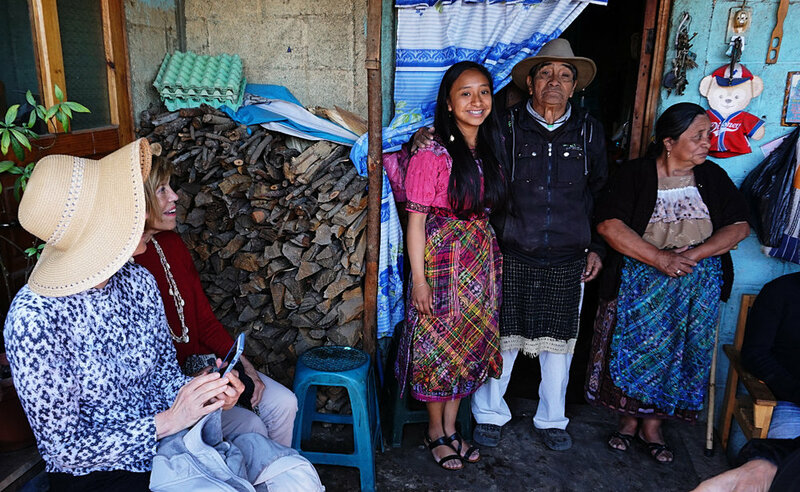 Later they visited the home of Naty (Natividad) Cojtí, one of our Progresa students, where they met 4 generations of her family and, in typical Guatemalan style, a 15 minute visit turned into a 2 hour party. 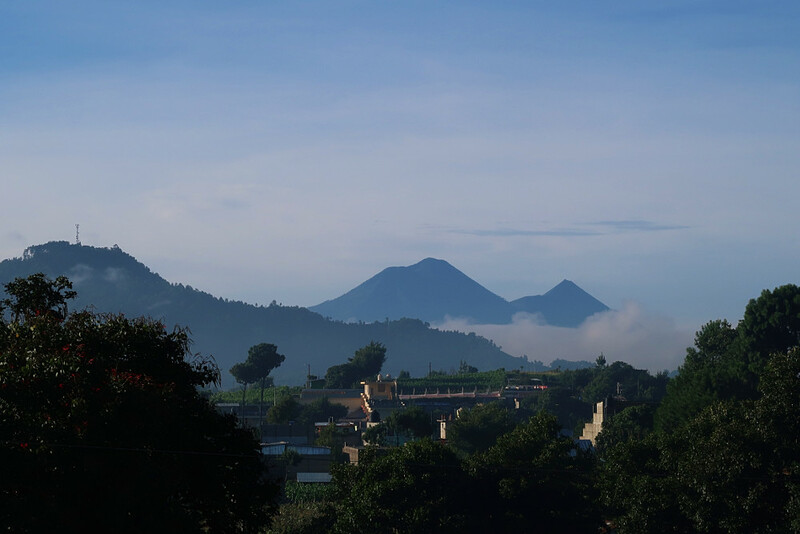 From there the group moved on to Quetzaltenango, more properly known locally by its Mayan name, Xela or Xelajú, where they reconnected briefly with two other ESL teachers. On the way they visited two of the most interesting churches in Guatemala, the elaborate yellow church of San Andrés Xecul and the most ancient church in the country in Salcajá. Events in Xela included a private tour through the Ixkik' Museum, a remarkable museum of traditional Mayan culture expressed through weaving and textile arts. 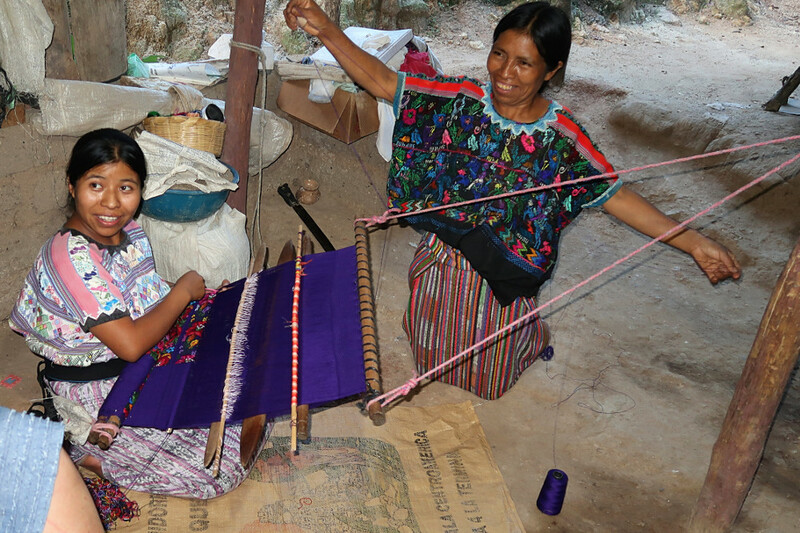 It is the work of four indigenous Mayan women dedicated to defending and preserving the culture of their people. 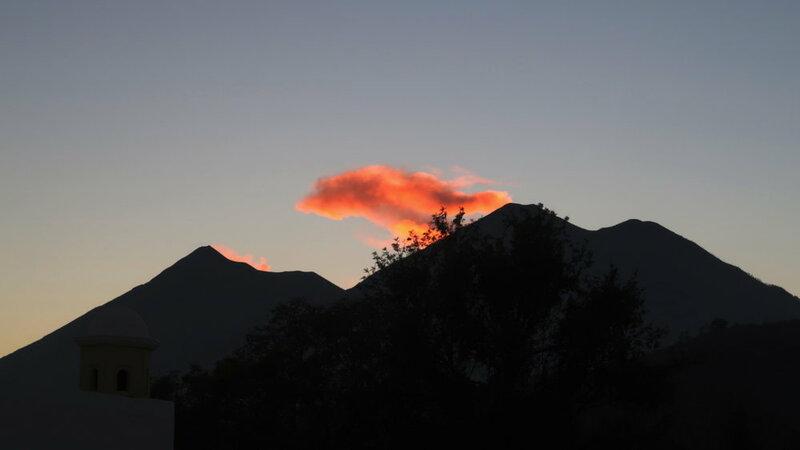 Later the tour passed through the lush Almolonga valley with its vegetable farms on route to the Georginas Hot Springs for a relaxing warm soak at the edge of the forest. The tour arrived at Chichicastenango the night before market day. This is one of the most famous markets in Guatemala, full or authentic (and not so authentic) Mayan artisanship. 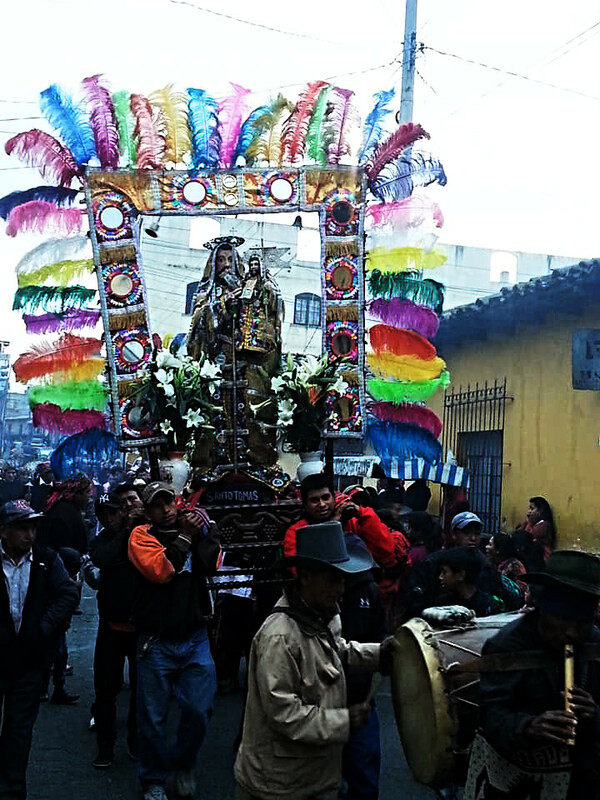 Unexpectedly, the tour was greeted by a procession through the streets of the Cofradía (religious brotherhood) carrying the images of Saints through town and into the church, replete with music, clouds of incense, and loud fireworks. Several members were also able to experience a mass at the Mayan influenced church of Santo Tomás. 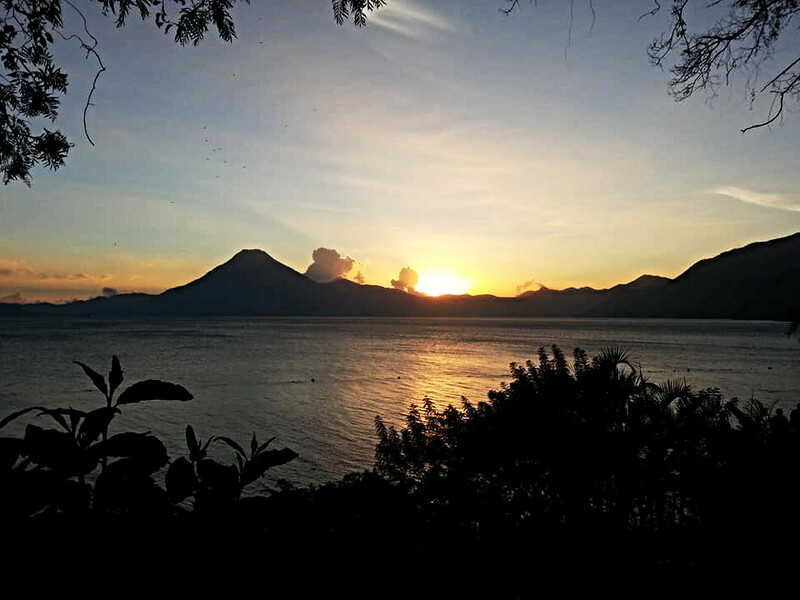 From Chichi, the tour proceeded to the spectacularly beautiful Lake of Atitlán, truly one of the wonders of the word: a huge deep blue jewel set in an enormous caldera with several large volcanoes around its edges. Members visited the towns of Panajachel, Santiago, and San Pedro around the edges of the lake, traveling by boat from town to town. In Santiago they were able to meet with another Progresa student, Concepción Chicajau, a nursing student, who gave them a tour of the town by open pickup, including a visit to her very small and simple house, where she shared the story of her life, including the tragic loss of her brother which motivated her desire for a career in health and medicine. Hearts were deeply touched. Around the Lake there were many more opportunities to explore markets with indigenous artisanal work, including a very successful weaving cooperative which has grown over 30 years from 17 war widows to 191 members. 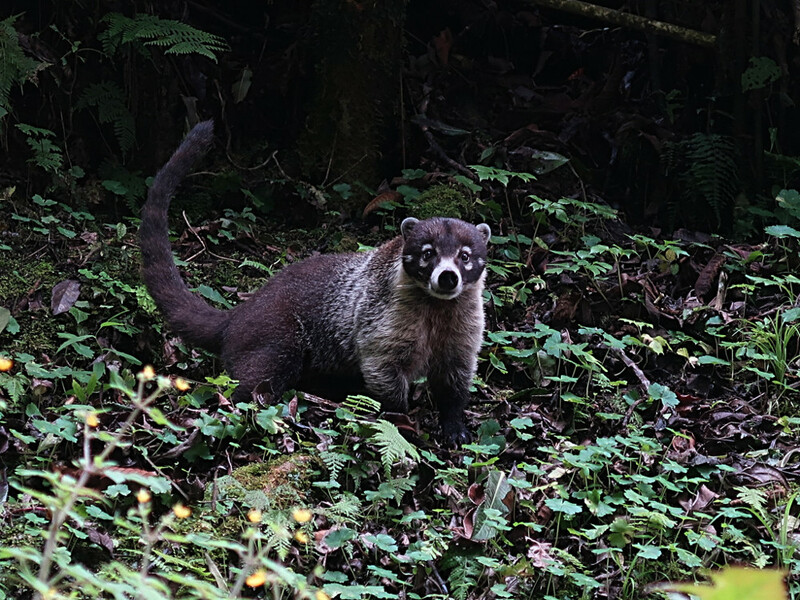 Near Panajachel, the group visited a Nature Reserve replete with suspension bridges between trees, waterfalls, and not so wild animals. 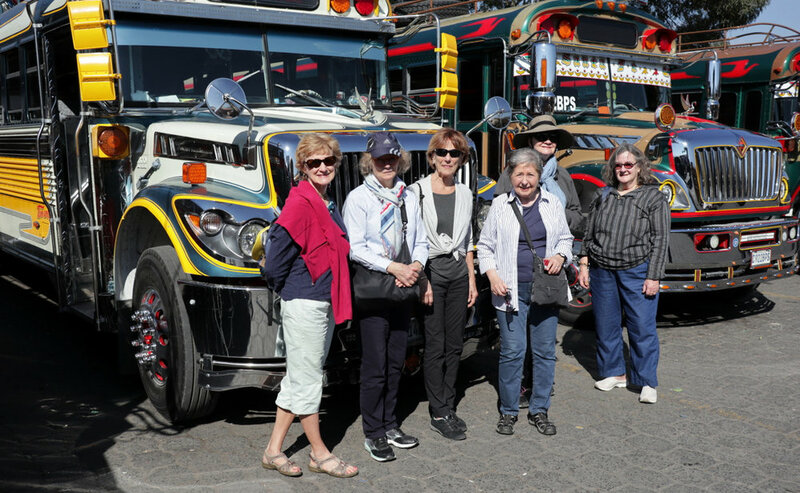 The trip culminated with a night to rest and relax in Antigua Guatemala, before members began to turn their eyes toward home. A good and educational time was had by all. Many thanks to Donna Smith and Miguel Costop for their work and dedication to make the tour possible. This year's ESL tour was another happy success. With 22 students and 22 teachers, it was the largest to date. Apprehensions by first time teachers quickly evaporated in the warm environment of the Posada Belén and the enthusiasm of the students. A number of the teachers were able to take part in a short tour the day before the main event started. We were able to visit a weaving cooperative in the nearby town of San Antonio Aguas Calientes, famous for tradition weaving with brilliant color and design, and a unique weaving technique used nowhere else in Guatemala. Lilian, one of the women in the cooperative, gave us a charming lesson in the history of weaving and its place in Mayan culture, emphasizing the desire of these women to preserve this culture and be sure that it is passed on to the coming generations. The simple backstrap loom is more complicated than it looks, as we learned by trial. We also got to dress up and participate in an imaginary wedding, with much light hearted laughter, in addition to a traditional light lunch of pepián and tortillas fresh from the comal. The week of teaching itself was a delight. Our students continue to grow and take more and more initiative. We find that they continue to grow in their command of written English, which is now required in Guatemalan studies, but inadequately taught. The opportunity to hear English spoken and to speak it themselves in a supportive environment is very important to them. As always, we had fun exploring Antigua together in small groups. Every year someone discovers something new and interesting in this charming little city. Our usual trip to visit a student's family took us to the small home of Nora Veronica Saban Car, presided over by her mother Cristina. Cristina is survivor of severe domestic violence who was able to escape and rebuild her life, working long hours to build a better life for her children. 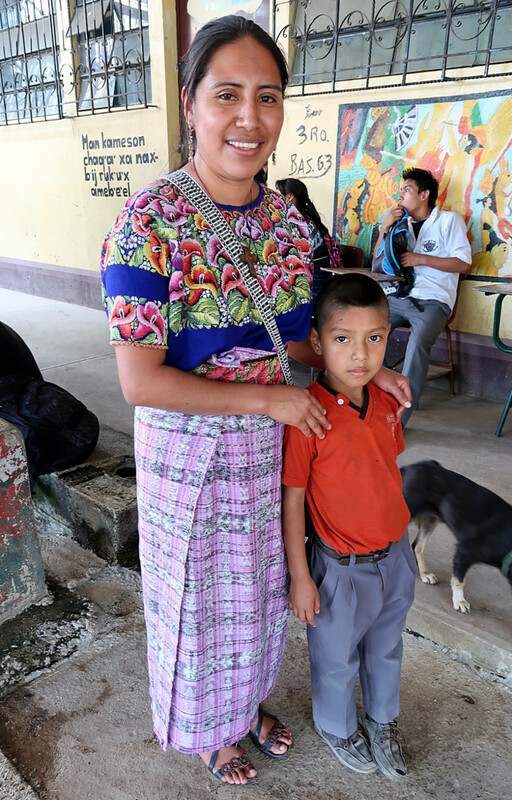 She has dedicated her life to bettering the estate of women in Guatemala, but had to sacrifice a hoped for career in law to be able to maintain the family. She grows corn and beans to feed them, taught herself to crochet in order to raise a little extra money, keeps a few chickens, and works at her job in social services. Her tiny garden is full of exotic and beautiful plants which she has collected and tended. Despite all this, she greeted us with the sweetest smile and warmest heart one could ever find; feeding us watermelon and little guisquiles that taste something like artichoke. Nora Veronica is working on degree in social work, following in her Mamá's footsteps. These are the kind of events and experiences that keep our hearts engaged in this program. 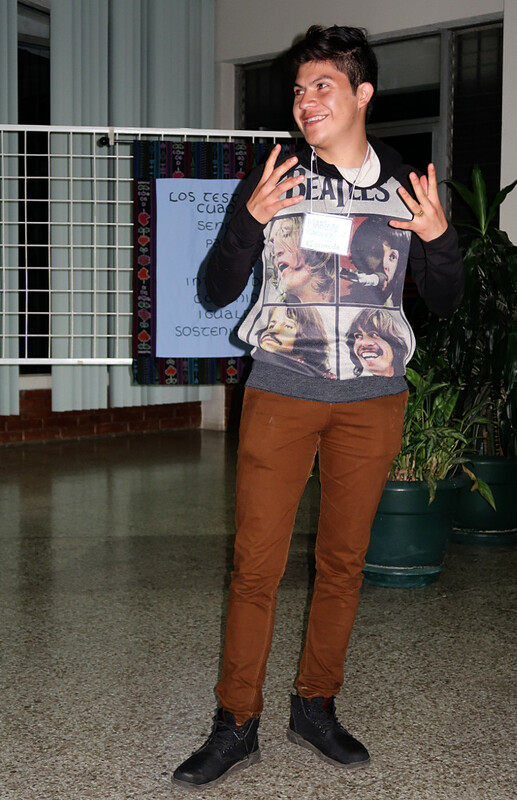 Another highlight involved our student Byron Anibal Joj. Byron just joined the program last year to complete a course in nursing. He lives in a pretty remote town in Totonicapán with his widowed mother and his wife and two little girls. Sadly, due to the economic state here, he has been unable to find professional work and has been working in a shop making pants. One morning he was absent from the program, and we learned he had left very early in the morning to take the bus to Xela for an interview for a potential nursing job at a new hospital for which there were many applicants. We were anxious all morning as to whether he got to Xela on time (3 hour + trip). He was able to rejoin us in the afternoon on the way to Nora Veronica's house. We first learned that the interview had gone well, and then found out to our delight that he had actually been hired and would start work as a surgical nurse in two weeks, in a place to which he can commute from his home. He is a happy and proud young man. We, too, are happy and grateful when we have such success stories. Byron has some hope that he may be able to go back for an advanced nursing degree in a few years. The week concluded with a graduation ceremony, which is always rewarding and heart touching for us teachers. Every year they take more initiative in planning and executing this event. This year a symbolic Mayan ceremony was added with a nice introduction in English by Karina Sic, a recent graduate in social work who now works in the Progresa office. We were also treated to and participated in a traditional dance from Santa Eulalia, Huehuetenango, led by our student Hermelinda Miguel Nicolás who comes from that town. We departed with hugs and good wishes, perhaps even a few tears. We have new friends and renewed hope for the future of this beautiful and damaged country, and through that hope for the whole world. To learn more about this amazing Teaching English Experience click here. The 2017 Student Conference was a great success. About 60 students and graduates attended. A more detailed description my be read in the spring newsletter, which should appear soon in the column to the right. The theme of the conference was Immigration, built on viewing of the film "La Bestia" and a detailed presentation by Luis Arena, a Guatemalan expert on the subject. Attenders found the information useful, thought provoking, and timely. We also had a useful presentation on nutrition by one of our current medical students, Herberth Beb. As always, one of the most important aspects of the conference is the building of community and networks amongst the becarios (scholarship recipients). 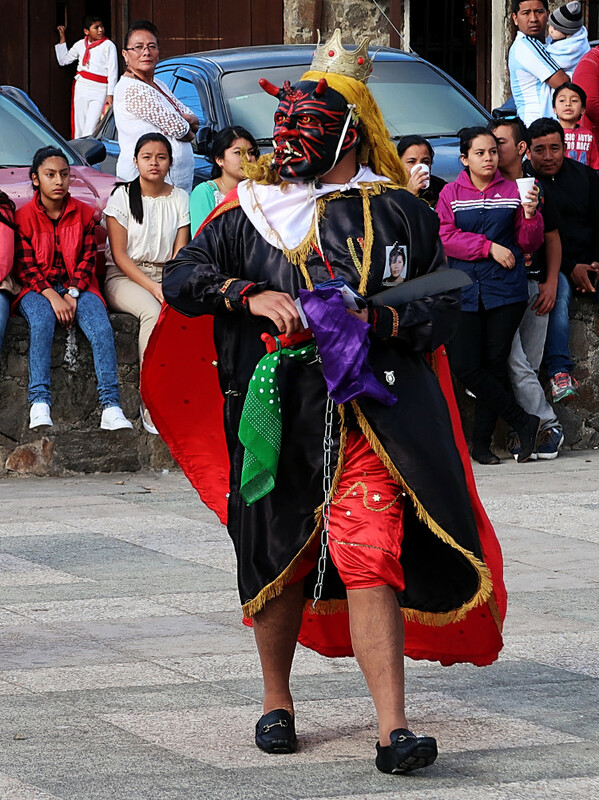 This was greatly enhanced by concurrent workshops on theater, dance, or visual art, each led by young Guatemalan artists; notably our own Aurelio Rodríguez in the visual arts. It was a delight to see these events start off with a lot of nervous laughter and some reticence, and end with joyful cooperative production. 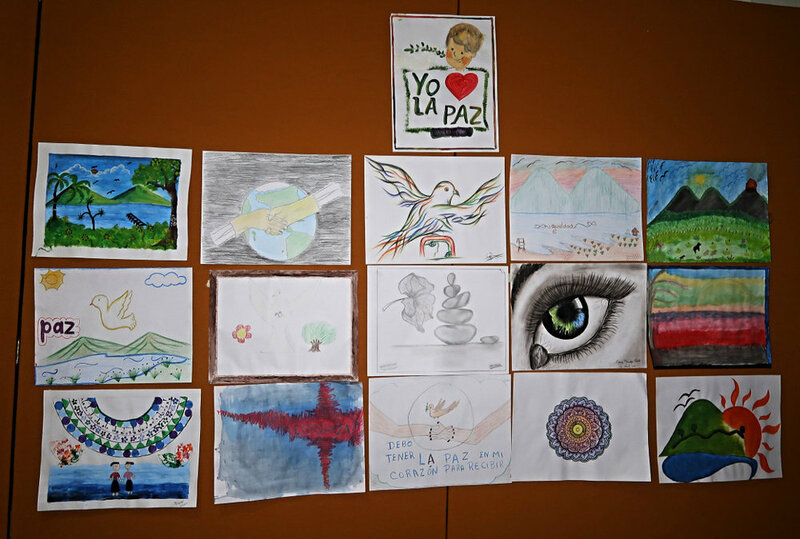 We expect these bonds to grow into a network of committed, impassioned Guatemalans whose presence and work will make a Guatemala where migration is less of an issue. There was much joy and laughter in the evening of community presentations, singing, dancing, theater, games, and more. For the Quakers among you, we had a grand Meeting for Worship under the trees on first day morning, attended by many of the becarios, although it was not a required activity. We are filled with hope for this great program and for these inspiring students dedicated to making their lives, their country and the world better. The 2017 Teaching English Experience included 19 students and volunteer teachers, who came from all parts of Guatemala and the USA respectively. Many were first time attenders, eager to learn and teach. We were pleased with the progress many of the returning students have made since the last event. Everybody loved working in the charming garden of the historic Belén (Bethlehem) Convent where Guatemala's own Saint, Hermano Pedro, healed and comforted many of the poorest of his day. 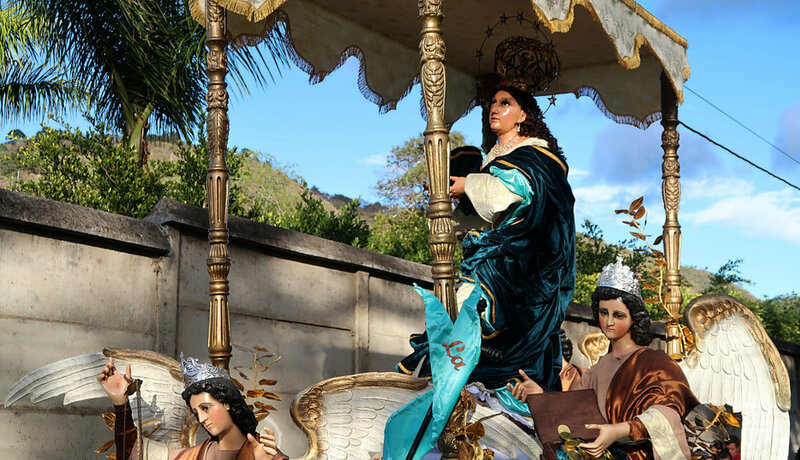 Exploration of historic Antigua and its surrounding provided new adventures for all, from museums of history and art to explorations of forests to watching a traditional religious festival. New friendships were made and old friendships renewed among and between teachers and students alike. This has proved to be more than just a short English lesson. The opportunity for students, many from quite isolated areas, to meet others from different areas of Guatemala and with different areas of expertise has been an important community and network building opportunity. Embedded above are videos from two students and a teacher. Be sure to click on the subtitles button for Yessenia and Lupita's videos if you are not a Spanish speaker. To learn more about the Teaching English Experience click here. The second North Pacific Yearly Meeting Junior Friends Service Trip took place from 8/5 to 8/16, 2016, with 10 Junior (high school age) Friends and three adult advisors. The project was expertly planned and carried out by Miguel Costop and the rest of the Progresa staff. A visit to the ancient Mayan city of Iximché, capital of the Kaqchikel Kingdom at the time of the Spanish Conquest opened the experience. Miguel's friend, Angelina Sacbajá, a midwife and Mayan Spiritual Guide, led us through a Mayan Ceremony in a park near Iximché. After explaining the Mayan principles and practices, she conducted the ceremony entirely in Kaqchikel. We were struck by the similarities between Mayan Spiritual Principles and those of the Religious Society of Friends. With this promising start, we moved on to the aldeas (small villages) surrounding San José Poaquil, where we worked on reforestation, planting a number of several varieties of trees; and worked teaching English to high schools students at a lovely school that values the conservation of Mayan language and tradition. It was hard work at times, but there was much satisfaction at the end of the day. The high point of this sector and of the trip as a whole occurred here. Each of us had the privilege of spending a day and a night with one of the families of our students or ex-students. Traveling by camioneta ("chicken bus") or tuk tuk, we fanned out to various places for an experience of life on a much simpler and poorer basis than that to which we are accustomed. The depth of love and hospitality we experienced more than made up for any lack of creature comforts, and friendships and connections were made that may endure. Many Junior Friends have shared afterwards that this experience was not only the high point of their trip, but that it changed their outlook on the world and the importance of possessions. 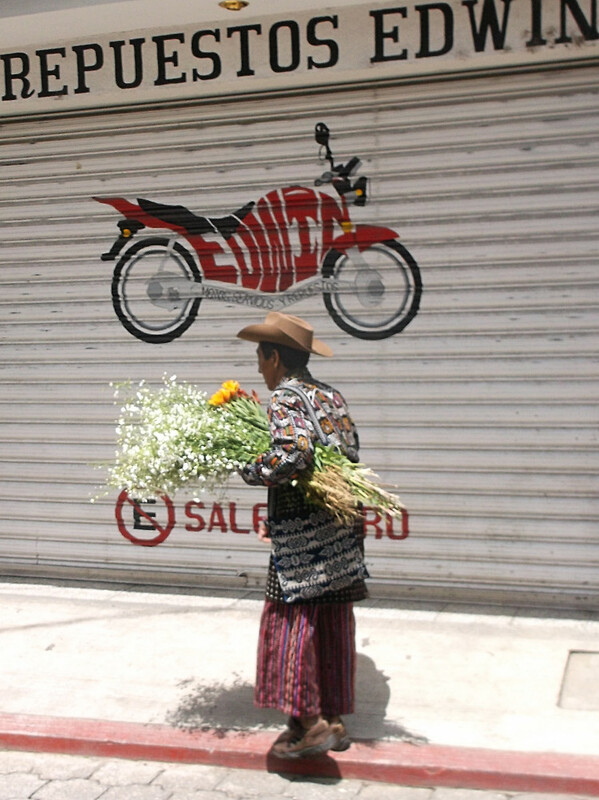 From Poaquil we went to Xela (Quetzaltenango) with a brief stop at the remarkable open market at Chichicastenango. These few days, povided different experience and a chance to experience a larger city, the second largest in Guatemala. Here we traveled to the smaller town of Momostenango where Gaby López, one of our current scholarship students studying forestry, led us on a clean up work party to a beautiful waterfall and hot springs polluted by mountains of trash. Her family treated us to a lovely lunch afterwards after which the JFs cleared a small piece of land (with machetes, which caused some anxiety on the part of the elders) to add to their organic garden of native and medicinal plants. We also treated ourselves to a day exploring some of the villages around Xela, but mostly luxuriating in the large hot spring of Fuentes Georginas. On our way out of town, we again met Gaby, who took us to visit her friends Thelma and Luís, who are the owners and operators of a 4th generation operation hand spinning, natural dying and weaving wool into beautiful blankets and rugs. And, of course, no visit to this region would be complete without a side trip to the unique yellow church of San Andrés Xecul, one of the wonders of the Mayan World. We finished our trip with a visit to the home of one of our students in San Pedro la Laguna, on the spectacular Lake of Atitlán, and his very charismatic grandfather, a sculptor in stone. The lake is very large and set in a huge caldera surrounded by several volcanic peaks. Antigua Guatemala was our last stop, and lovely city with much of the Spanish Colonial flavor and many ruins from the early days of the Spanish occupation. All returned in one piece, tired, but with experiences to change a life, not to mention lives changed for those of us who worked with and for them. If any are interested in arranging such a trip for another group of young Friends, you may contact Progresa through this website or at progresa3@gmail.com . 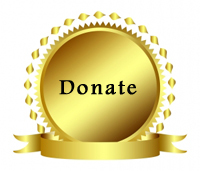 You may also contact Joe (josephhoytsnyder@gmail.com) or Jane (jmwsnyder@gmail.com) Snyder for ideas and details. 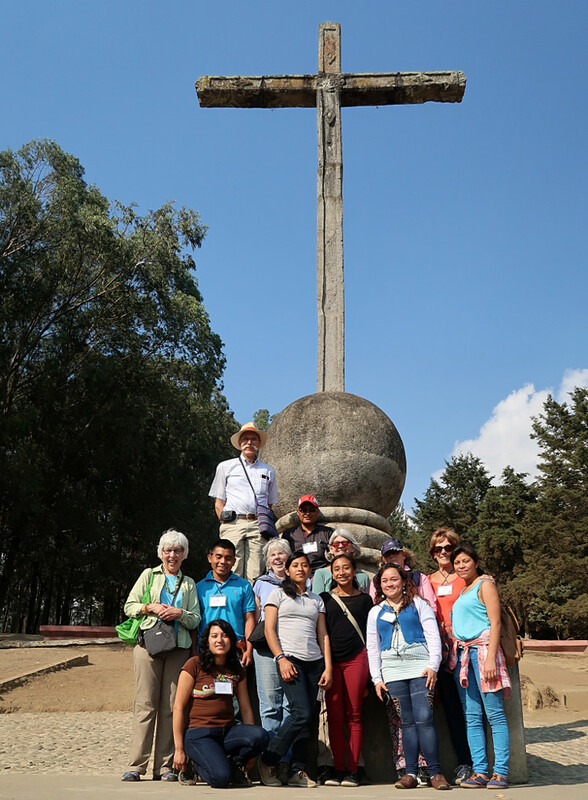 From 8/8 to 8/19, 2014, twenty Junior Friends (high school age) from North Pacific Yearly Meeting traveled to Guatemala for a learning and service trip, organized superbly by the PROGRESA Guatemala Friends Scholarship Program. 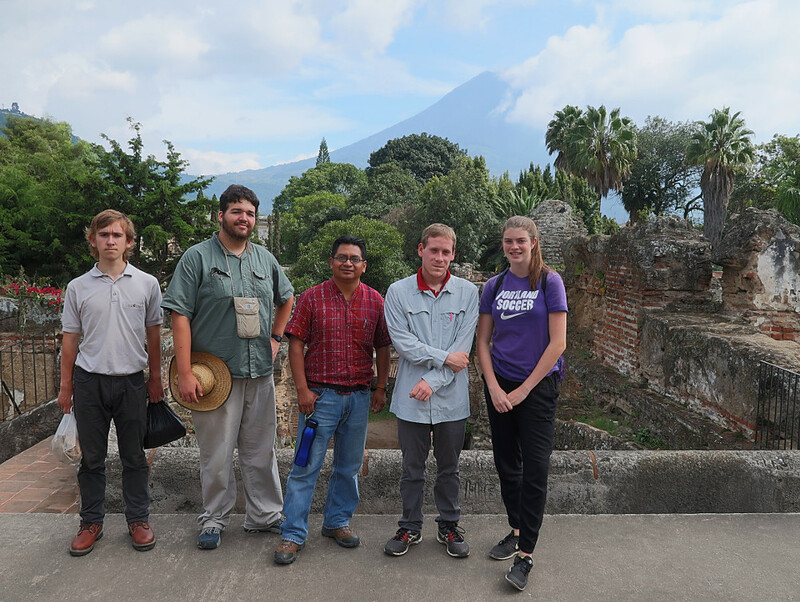 Our introduction to Guatemala was a visit to the ruins of Iximché, the capital city of the Kaqchikel Maya at the time of the Spanish Conquest. Included in this visit was participation in a Mayan spiritual ceremony explained and performed by a midwife and spiritual guide. This remarkable day culminated in a delicious dinner at the home Miguel Costop, director of PROGRESA and our guide throughout the trip. After that dynamic start, we spent three days in the little town of Santa Cruz Balanyá, where a PROGRESA student was completing her internship with a well organized women's co-op. Mornings were devoted to a reforestation project where well over 2,000 trees were planted. During the afternoons we taught English at the local middle school. All this under the care and direction of members of a women's co-op who provided the seedlings and fed us generously and deliciously each midday. This segment culminated in an overnight home stay with a local family, the most dramatic experience of the journey for most of us. Deep friendships were made in this very short time. After fond farewells, we traveled to Xela (Quetzaltenango) with a detour to visit the fascinating (and famous) weekly market at Chichicastenango and a brief visit to the intriguing yellow church in San Andrés Xecul where we were met by another PROGRESA student. In Xela we visited a school for street children or those at risk of becoming street children, founded by another PROGRESA scholarship recipient. There we did a deep cleaning of the school, played joyous futbol with students and staff, and worked on a piece of farmland neglected and damaged by climate change induced drought. The following day, we visited the nearby town of Momostenango where Gaby López, one of the current PROGRESA scholarship recipients, shared with us her passion for and concerns about forestry in her region, and showed us a section of forest ravaged by the pine bark beetle inadvertently imported from Canada by local furniture makers. After visiting a nearby 5th generation family hand weaving operation producing some of the woolen blankets and carpets for which Momos is famous, we were treated to lunch at Gaby's house in a compound set up for families traumatized by the violence of Guatemala's 36 years of civil war. Her family fled to Mexico in the face of extreme violence to her grandfather and uncles and were repatriated in this area where 5 families are working together on organic plant production and preservation of plant species used for food and traditional medicine. We finished the day with a chance to see some local natural wonders, including a beautiful waterfall on a polluted and trash laden river. We couldn't clean up the river, but we at least (without any prompting from leaders) picked up all the trash from the trail leading to it. From Xela we had a day of travel punctuated by a visit to the spectacularly beautiful Lake Atitlán with a boat ride from Panajachel to the pretty town of Santa Catarina Palopó. The last day, in Antigua Guatemala, was given to relaxation, preparations for travel home, and grateful worship. During our travels, we were able to meet several PROGRESA students or graduates, learn first hand about the hardships they face, and realize how important the program has been in overcoming them. These are the descriptions in time and space. What is left out are the laughter and tears, exuberance and exhaustion, cooperation and community, deep places of worship and gratitude, and the transformative seeds that have been planted in many hearts. We are all immensely grateful to the PROGRESA Guatemala Friends Scholarship Program and to Miguel Angel Costop Bala in particular. The dedication, local knowledge, connections with students, understanding of Quaker values, and the care and love shown created a truly life changing experience.